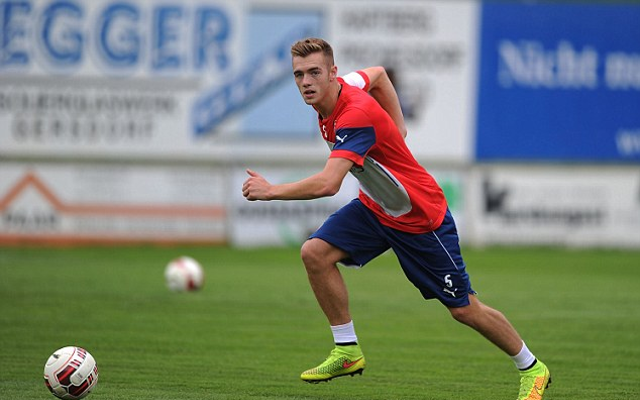 Arsenal manager Arsene Wenger has praised young defender Calum Chambers following a difficult first-half against Liverpool on Monday night. The 20-year-old made his first start for the club since March as he came in for Per Mertesacker and Laurent Koscielny, who both missed the game at the Emirates Stadium through illness and a back injury respectively. In their absence, Chambers partnered Brazilian Gabriel Paulista at the heart of the Gunners defence and the former struggled with the presence of Reds striker Christian Benteke in the opening 45 minutes and had the likes of Petr Cech and Francis Coquelin to thank for saving his blushes at times. “He showed character,” the Frenchman told the club’s official website. “I have spoken to him and he’s a strong footballer, a dedicated player who is ready to work day and night. He has the talent to be a good player,” Wenger added. Chambers could keep his place in the team for the early kick-off against Newcastle United today as both Mertesacker and Koscielny are considered doubtful for the game at St James’ Park.